Most of our couples call us to book planning services months in advance of their wedding and we get to know them through working with them up to their wedding date. But that’s not always the case. Some couples work diligently on their weddings on their own in the months leading up to their big day and at the last minute decide that they need help after all. Just recently we got that call just one day before the wedding! That’s right – one Friday afternoon we were called in to work with Jasmin & Carlos to help with their wedding that was scheduled for the next day! They were getting married at Texas Old Town in Kyle, where we met them at 4pm to visit with them and take an assessment of where they were. Jasmin and her friends were already decorating the tables when we arrived. She handed me a torn and crumbled piece of paper that had her timeline on it and after getting a quick rundown of her vendors and some thoughts on her big day we went to work. First on our to do list – Call the vendors. And thank goodness we did! Even though Jasmin had her own timeline for her wedding day, some of her vendors had different times for their arrivals. Second – Working with her vendors, we developed a firm timeline for the wedding day and shared it with all vendors and wedding party members. And third – Get to know this beautiful couple! Just a thought – Even though this isn’t our normal course of events, due to the unique circumstances we had to shake things around a bit. When you’re building your dream wedding it helps to stay flexible and not be afraid to make adjustments when necessary. The same goes for choosing your planner. It’s better to work with someone that can easily adapt to changing situations over one that is very rigid and not willing to work around the inevitable bumps in the road. Over the course of the rehearsal dinner we got to know Jasmin and Carlos, along with their friends and family. When you share a meal with someone’s friends and family you get to know a lot about them in a really short period of time. Their wedding party was so helpful with all of our questions and each person took on different tasks for the wedding day to help things run smoothly. You could tell right away that this couple had a strong support system in their friends. Carlos and Jasmin’s wedding day had its share of interesting and exciting moments but we were able to get through them because we worked together in advance to develop a plan for various situations and when they occured everyone stayed calm and kept level heads. Since they had hired us as their planners they were more fully able to enjoy their big day because there were so many little details that were no longer their concern. We took them on for the couple. 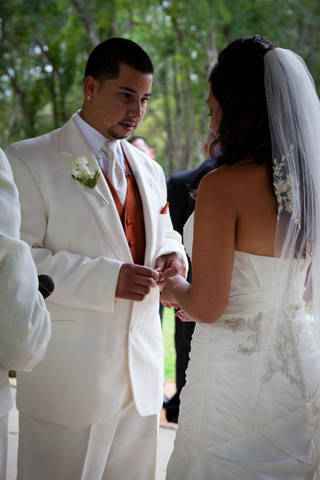 Jasmin and Carlos had planned this wedding for a long time and spent a lot of their hard earned money making it happen. They deserved to have a beautiful and memorable wedding and we’re excited that we were able to make that happen for them.